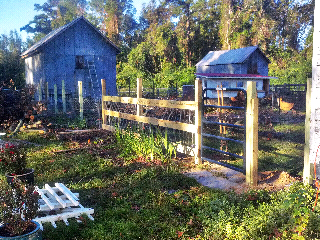 Two months after Hurricane Irene, we are still spending most of our free time trying to piece the farm back together. A few weeks ago we were finally able to get a tree crew out to take down the dangerously positioned huge oak tree that split in half during the storm leaving half standing and leaning over our new chicken house and small packhouse and the other half precariously hinged against a small walnut tree waiting to tumble down at any moment. For almost a month, our backyard was a place to stay away from. 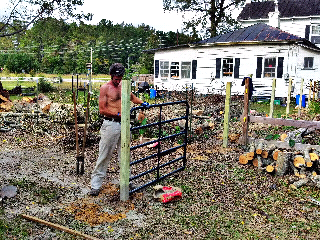 Now that the tree is safely on the ground, we are rebuilding fences and trying not to grovel too much about the fact that we now have little to no shade in our backyard. You don't realize how much you appreciate a tree until it is gone. And by "gone" I solely mean it is no longer shading our yard. It is far from gone. We'll be chopping this oak tree up from now until the end of time. The good side is that we now have plenty of good firewood for the new (used) woodstove we bought over the summer for the house. It's not hooked up yet, thanks to the hurricane throwing more immediate and unplanned projects at us, but we are hoping to get it up and running before it gets too cold. 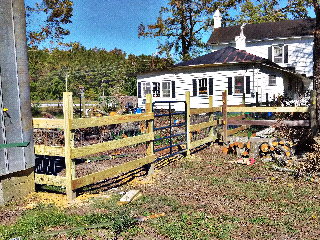 The tree took out the fencing in our backyard so Cliff is replacing it with nice three board fencing lined with mesh wire to keep the dog in and the chickens out. 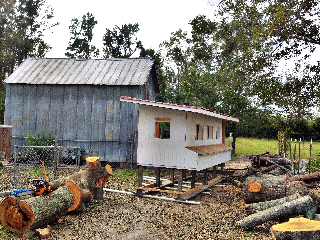 We were mid project in building our new huge chicken house before the hurricane, and then the split tree decided to lean itself right over top of it. In order for the tree crew to be able to take the tree down, we had to attach skids to the legs of the chicken house, hook it to the truck, and pull it to safety into a pasture beside it. It stayed there for several weeks until the tree crew came and left, and finally we were able to hook it back up and drag it back to where it was supposed to be. 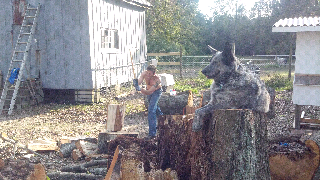 Farm dog Emma finds the perfect perching spot on top of the base of the tree we had cut down... she can watch her boy chop wood perfectly now and not be in the way. 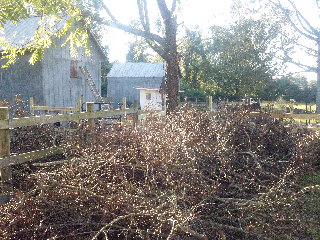 Having the wood for the woodstove is wonderful but the leftover branches and leaves are everywhere. We are going to chip and mulch as much as we can with our chipper and use it in our gardens. 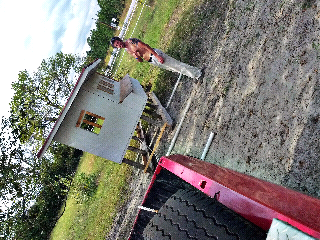 Chicken house somewhat pulled back to the general area. 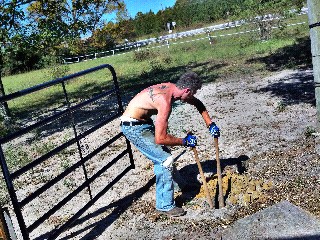 We then had to move it towards the pen by hand.